OBO fleet in response to a growing concern over the number of losses of this type vessel in recent years. Mipo Dockyard (HMD) for exten- sive steel renewal work on her hull and holds. Pan Ocean operates 10 vessels ranging in size from 100,000 to 245,000 deadweight tons, all of which were built between 1968 and 1988. The fleet is operated in the expanding iron ore and coal trades between Australia and South Ko- rea. "It is because of our heavy in- volvement in this trade that we are taking the life extension decision," said a company spokesman. Pan Ocean, unlike other opera- tors in the market with comparably aged fleets, has been reluctant to order new Cape-size tonnage. Organization at its spring meeting of the Marine Environment Protec- tion Committee (MEPC) 32, held earlier this month in London. One date to keep in mind is July 6,1993, which was recommended by the IMO Working Party as the effec- tive date for which contracts for new tankers must be double hull, mid- deck or the environmental equiva- lent. A keel-laying date of 6 months later and delivery date of 3 years later will be recommended to MEPC. The working party was unable to agree, however, on the lower effec- tive limit, either 600 or 3,000 dead- weight tons. As for existing tankers, three pro- posals received support—(1) upgrad- ing and phasing out tankers based on age and calendar dates; (2) ap- plying measures for upgrading ex- isting tankers based on an acciden- tal oil spill number concept; and (3) strengthening requirements for sur- vey and inspections in lieu of the phaseout and upgrading plan. Pathogens from Ships' Ballast Wa- ter and Sediment Discharges." Environment Protection Committee (MEPC), the guidelines recognize a number of alternatives, including retention of ballast water, exchange of ballast water at sea, control of sediment uptake, and discharge of ballast water to reception facilities ashore. The Coast Guard is urging ship operators to adopt these guide- lines in order to decrease the further introduction of cholera and patho- gens in U.S. waters. Division (G-MEP) at (202) 267-0426. All The Wfy To The Bank. 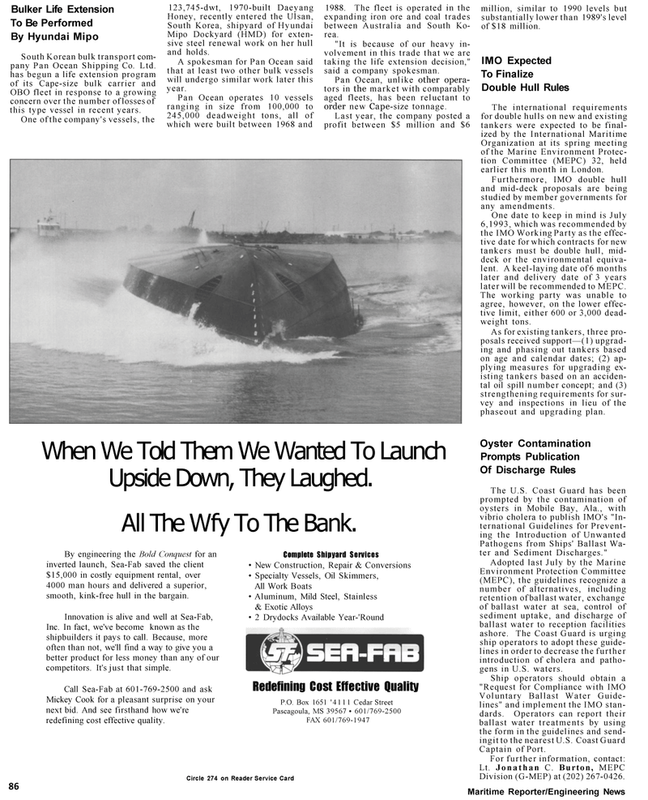 By engineering the Bold Conquest for an inverted launch, Sea-Fab saved the client $15,000 in costly equipment rental, over 4000 man hours and delivered a superior, smooth, kink-free hull in the bargain. Inc. In fact, we've become known as the shipbuilders it pays to call. Because, more often than not, we'll find a way to give you a better product for less money than any of our competitors. It's just that simple. Mickey Cook for a pleasant surprise on your next bid. And see firsthand how we're redefining cost effective quality.